Motherhood can be incredibly joyful and challenging all in one. Our intention in creating the Mama Magic kit was to allow mums or mothers-to-be the opportunity to pamper the senses and come back to themselves in an easy, and fuss free way. 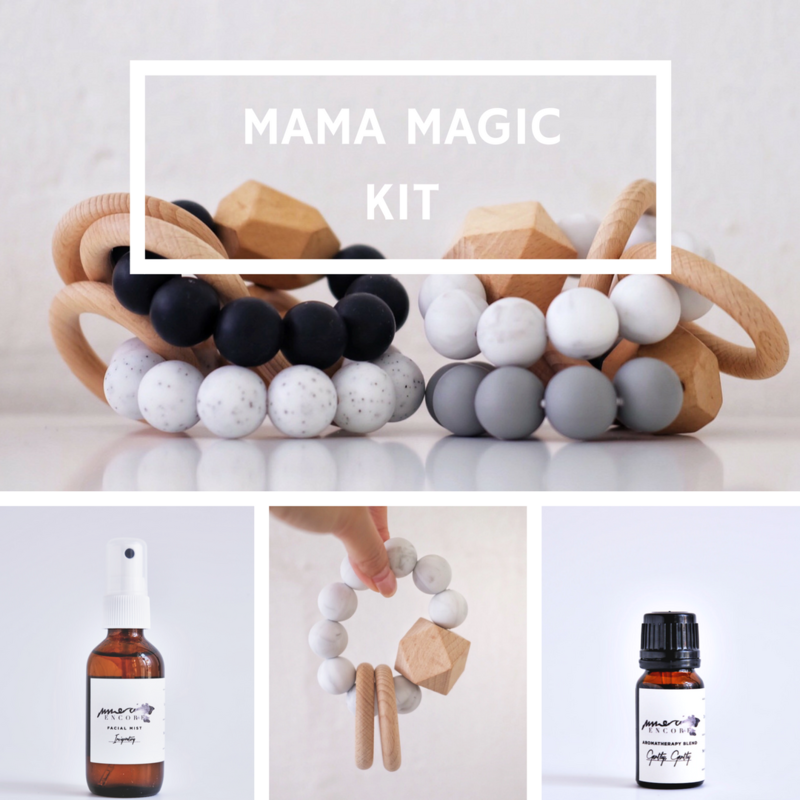 Mama Magic offers a touch of TLC and wellbeing for every mum and her little one. Gently, Gently Blend to de-stress and uplift (10ml, full size). For mums & babes to enjoy in their nursery, playroom, office or living space: burn or diffuse a drop in any living space or bath (for mums) for a positive, supported outlook. Gently, Gently is a gorgeous, gentle blend that is best enjoyed when released into the atmosphere. A super chic 20mm BPA free silicone bead ring teether, courtesy from our friends at Oh Happy Fry! Made in NSW Australia, these beads are made of untreated wood rings and create a delicate rattle. 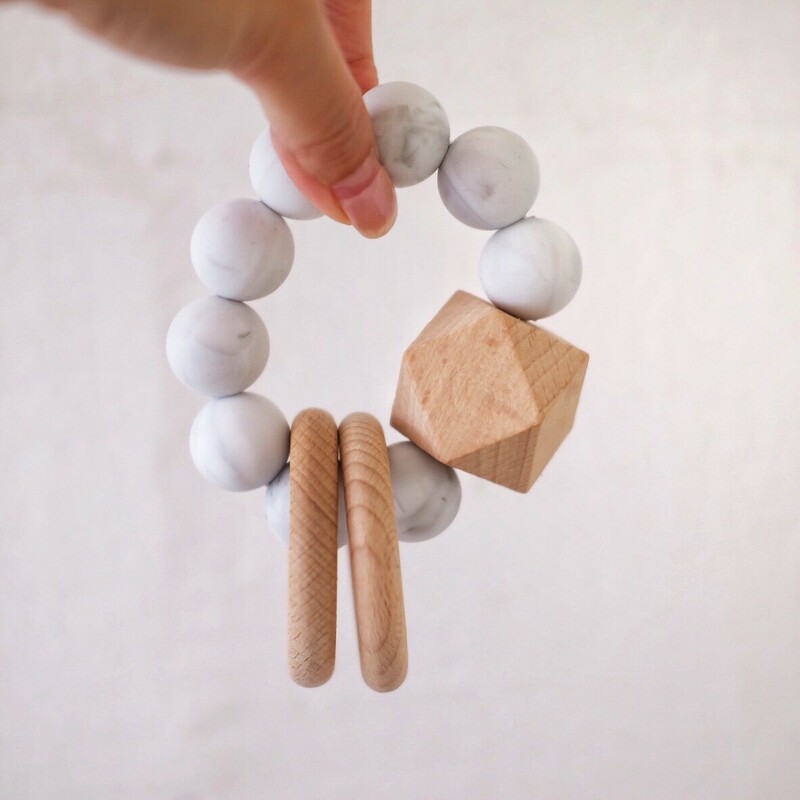 Each non-toxic teether meets meets international toy safety standards and is completed with a bigger 35mm untreated beech wood bead for a truly tactile experience for your tot. Strung together on a durable nylon cord that can withstand temperatures up to 60 degrees Celsius. Cleaning is a breeze: simply wash in warm soapy water and air dry. Colours may vary with each order. EDITOR'S NOTE Parents should remember to avoid the direct use of unblended/undiluted essential oils on babes (and on their own skin). When in doubt about the safety of the essential oil for your kid, ensure your child is over the age of 3 months for the use of essential oils such as lavender, chamomile roman and mandarin; and ages 2 and up before exploring other oils such as lemon, patchouli and the like. If lost, we invite you to also drop us a message, whether on our Instagram or via email and remember, common sense & the direction of your child's pediatrician prevails.